This SINGLE PHASE 10 HP B10VS Rotary Screw Compressor is truly a one of a kind. The VSD drive allow 10 horsepower on a single phase circuit. Matched with a rotary screw air end it will supply a constant 37cfm at 145psi. Tank mounted with a prefilter and refrigerated air dryer this compact compressor will give years of quiet and reliable service. An additional benefit is the economy of a VSD drive that minimizes inrush current at start up and matches air production to air consumption. DV Systems is a Designer of High-Performance, High-Efficiency Air Technology Solutions. They have been engineering and manufacturing industrial air compressors since 1954 and their commitment to a culture of innovation dates back 100 plus years. For more information on this SINGLE PHASE 10 HP B10VS Rotary Screw Compressor download the brochure or contact us. 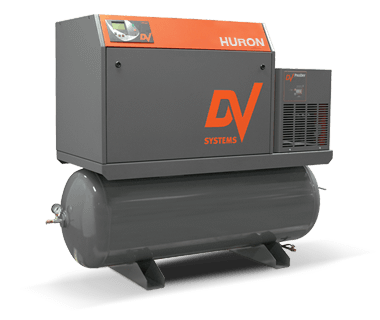 We offer a wide range of air compressors and accessories. Call us to discuss your compressed air needs at 705-722-5747 or email us.